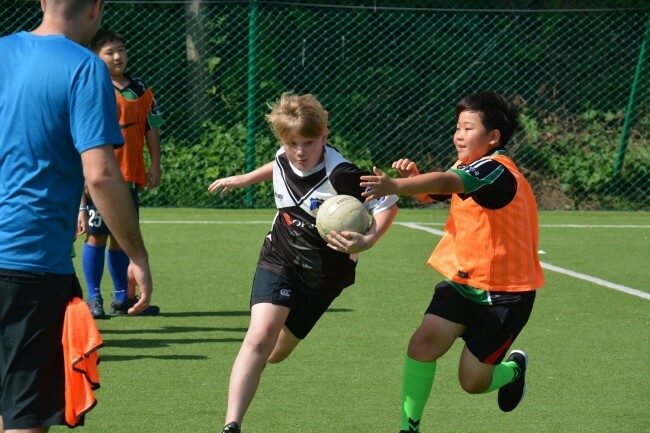 The Korea International School held its annual Gaelic Football Season at its campus in Seoul on Sept. 2, co-organized by the Gaelic Athletic Association and the Irish Embassy, the school said. The event was to promote global friendship and was joined by family members and students from KIS’s another campus in Pangyo, Gyeonggi Province, it added. With campuses on three different locations in Seoul’s Gangnam, Pangyo and on the southern island of Jeju, each school branch focuses on building strong community relationships and cultural understanding as an integral part of the education. Over the past three years, KIS worked together with the GAA and the Irish Embassy for the football tournament as a way to introduce Irish as well as other international cultures to the students. During the tournament, KIS students enjoyed the opportunity to meet people from all over the world and to develop communication and problem-solving skills while interacting with them. Through organized team sports like football, students can foster teamwork, leadership and perseverance, the school said. These skills are critical for the students to work as a team and get tasks done, it added. Founded in 2000, KIS has seen impressive admissions results with students admitted to such top schools such as UC Berkley, MIT, Stanford and Duke.